Despite the fear that genetically modified (GM) foods are dangerous, experts in the country of India can assure the biosafety of the crops. This likely didn’t quell many fears given the reactions from some activists, who were looking to counter the possible green stamp of approval that GM mustard plants were given by India’s Union Ministry of Environment. Another group looking to protest GM mustard plants, surprisingly, were beekeepers, who recently held a protest against GM mustard plants, claiming they could kill bees. However, the South Asia Biotechnology Centre (SABC) and the Association of Biotechnology Led Enterprises-Agricultural Focus Group (ABLE-AFG) said GM mustard actually “bolsters honeybee population,” and the myths associated with GM crops are nothing more than hoaxes. “GM mustard does not contain any insecticide that will kill honeybees visiting its flowers nor enhances use of sprayable insecticides. 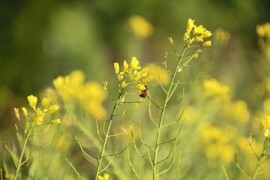 On the contrary, GM mustard, with its hybrid vigor, will help in increasing more visits of honeybees and consequently of their population,” said an SABC report quoting Dr. Govind Gujar, the former head of the Indian Agricultural Research Institute (IARI) in New Delhi. The professors and the developers of the hybrid plant who submitted a biosafety report to the Union Environment Ministry said it was unethical for someone to create fears regarding scientific developments among farmers and the public. IARI representatives also reassured beekeepers and said they should be “swayed away with activists” who are advocating the alleged negative impacts the plant would have on beekeeping. The SABC report also quoted many examples that included farmers already using the GM product. “Farmers in Australia, Canada, and the U.S. have been benefiting from growing GM canola (Canadian mustard) since 1996,” SABC said. Some believe the protesting beekeepers were put up as a front for the activists in a desperate attempt to derail the approval of GM mustard. This tactic has been acted out in Europe and in parts of the U.S. as well. There is currently no scientific evidence suggesting that bees are adversely affected by any GM crop.